With a doorphone, persons within your office or building can speak directly with outside visitors. 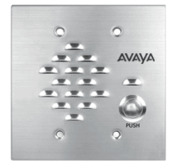 The Avaya Partner Door Phone is ideal for indoor as well as outdoor applications. The Partner door phone connects directly to an extension port. Contact Closure adapter not included. This door phone is compatible with all Partner ACS releases.